Right off the bat, I’d like to start out by saying I have always been totally intrigued by traditional Indian music, and as you might expect by judging the two countries’ proximity to each other, traditional Sri Lankan sounds share a lot of similarities. If you haven’t figured it out by now, I am also a huge fan of the juxtaposition of traditional folk and ethnic styles with any type of metal. So anything that incorporates both of these things together, you can pretty much guarantee I’m going to love it. My favorite White Zombie song of all time is “Blood, Milk, and Sky”; I’ve always loved Type O Negative‘s “Can’t Lose You” and Amorphis‘ “Greed” … I think you get the picture. However, before I go any further, I do have to disclose that while this album contains plenty of traditional Sri Lankan instrumentation as well as lots of black-metal-oriented material, it doesn’t quite blend all of these elements quite as much or as often as I would have hoped. Having said that, this is still an intriguing hour worth of music that is sometimes a bit challenging, sometimes rather engaging, but always (dare I say it?) entrancing. The first side, Astral Mantras, begins with Funeral in Heaven leading a fascinating journey in their country’s ethnic heritage with the twelve-minute opus “Transmigrations into Eternal Submission (of Altered Consciousness).” Anyone who has seen video of Ravi Shankar performing, perhaps in the Woodstock documentary or elsewhere, can have some idea of how this sounds: a captivating and complex backbeat provided by the tabla, starting out slowly, with elongated droning tones in the background, and an exotic system of melody and countermelody complete with plenty of microtonal intervals, all of which gradually increase in tempo and intensity, until eventually they reach a state of fervor, then gradually winding down again. In this case, though, the lead part is primarily filled by the violin, and the drones that typically come only from the resonance of the sympathetic strings on the sitar, are here supplemented by overdriven electric guitar power chords. The remainder of this half of the album consists of two other songs, which are both much more metallic in nature. 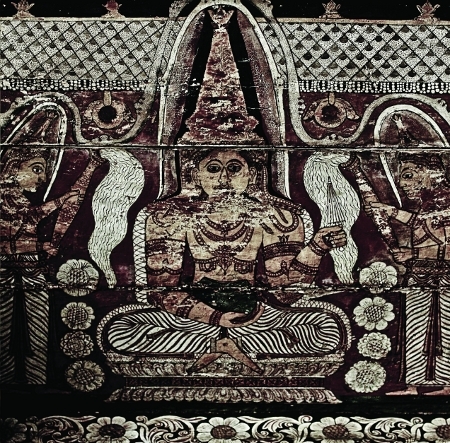 First is the thirteen-minute “Bandhana (Gatahaththey Kathaa Wasthuwa)” which comes across as a sludgey, funereal waltz of the damned, utilizing chiefly a metal arrangement, although shortly past the midpoint the violin from the preceding track slinks its way in underneath some dark, ritualistic-sounding recitations, remaining in the mix briefly until the black metal vocals return. 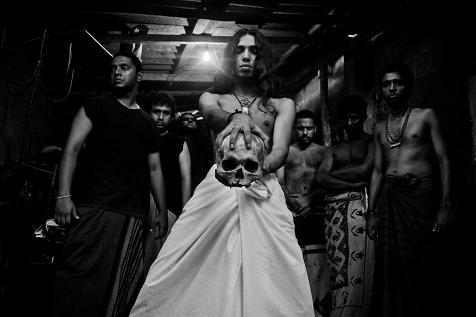 Closing out this side, and clocking in at “only” seven and a half minutes is “Buddhang Saranang (Thapas Tribute),” which includes a fairly sparse instrumentation of some heavy blues-metal riffing over a tribal-feeling drum part, with a blend of more black metal vocals with somewhat more traditional heavy metal singing (which is, incidentally, in English). On the reverse side of the record, Dyslexia, Plecto Aliquem Capite get things started similarly, using traditional acoustic instruments on the much shorter (just under five minutes) “Lament.” Very aptly named, this somewhat more minimal piece is predominantly some minor-key arpeggios in the background of a mournful violin duet, accompanied by some mostly-indistinguishible anguished cries. From there, this band takes things in a far more experimental fashion, drawing partly from black metal, but also from avant garde and noise directions. “Stoned Guru Ramblings,” which runs nearly seven minutes, is essentially built on top of sampled bits of speech — clearly, the titular “ramblings” — all sliced and diced and spliced back together, with a blend of blackened sludge metal and no-wave/noise insanity layered throughout. “Cemetary of the Deep” continues in a similar theme with dirgey sludgey black metal, with extremely dissonant and amelodic black-ish vocals that again are chopped up and manipulated almost beyond recognition as actual vocals. This entry was posted in New Releases, Reviews and tagged Colombo, Dunkelheit Produktionen, Funeral in Heaven, Plecto Aliquem Capite, Ravi Shankar, Sri Lanka. Bookmark the permalink.